1,426 pages | 20 Color Illus. | 55 B/W Illus. The presence of chemicals in our environment is a subject of intense interest owing to the many potential adverse health effects to humans following exposure to these chemicals. The principles and practices of risk assessment are used to assess the associated health risks to provide a scientific and health basis for guidance or regulatory standards development and risk management decision making for public health protection. 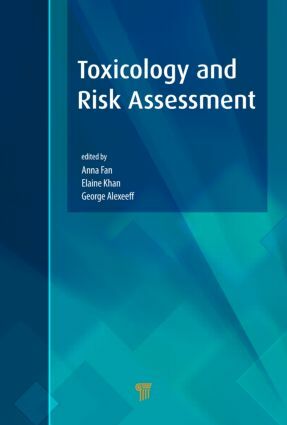 This book compiles, discusses, and presents cutting-edge research data and methodology in performing risk assessment of some major chemicals of concern in our environment. It also discusses the complexity of the scientific databases, the available and updated methodology, emerging issues, limitations in knowledge and methods, considerations of developmental and age sensitivities, use of defaults, case samples on results in risk assessment and risk management, and current and future perspectives. The editors are prominent in the field of environmental toxicology, risk assessment, and chemical regulations. This book will appeal to those interested in evaluating the human health effects of exposure to chemicals in the environment and the associated assessments and findings. Anna M. Fan has served as chief of the Pesticide and Environmental Toxicology Branch, Office of Environmental Health Hazard Assessment, California Environmental Protection Agency for more than 20 years. She managed chemical risk assessment programs, which include risk assessment of chemicals in drinking water, air, and food (including fish advisories), plus pesticide toxicology and related environmental and occupational exposures and medical education. She is a Diplomate of the American Board of Toxicology and a full member of the U.S. Society of Toxicology. She has served on the U.S. EPA Science Advisory Board Committee on Drinking Water and Exposure and Human Health Committee; U.S. EPA Endocrine Disruptors Screening and Testing Advisory Committee; U.S. EPA Federal-State Toxicology Risk Analysis Committee; National Research Council Committee on Groundwater Recharge; International Agency on Research in Cancer Workgroup on Nitrates/Nitrites; U.S. Centers for Diseases Control/ATSDR Board of Scientific Councilors; California Pesticide Registration and Evaluation Committee; and other international committees. Dr. Fan is an editor of the Journal of Environmental Science and Health Part C, Environmental Carcinogenesis. She has authored numerous publications and edited two books on toxicology and risk assessment. Dr. Fan is presently an independent consulting toxicologist. Elaine M. Khan is chief of the Water Toxicology Section of the Office of Environmental Health Hazard Assessment (OEHHA) in the California Environmental Protection Agency. She oversees the development of Public Health Goals for chemicals in California’s drinking water. She earned her PhD in biochemistry and molecular biology from the University of California, Davis, and has published over a dozen articles in peer-reviewed scientific journals and reviewed numerous risk assessment documents for the OEHHA and other agencies such as the California Department of Pesticide Regulation. Dr. Khan is a member of the Society of Toxicology and the Federal-State Toxicology Risk Analysis Committee. George Alexeeff is director of the Office of Environmental Health Hazard Assessment (OEHHA) in the California Environmental Protection Agency. He was appointed by Governor Brown in 2012 and unanimously confirmed by the state Senate in 2013. He oversees a staff that includes 80 scientists in multidisciplinary evaluations of the health impacts of pollutants and toxicants in air, water, soil, and other media. Dr. Alexeeff is also an adjunct professor in the Department of Environmental Toxicology at the University of California, Davis. He earned his PhD in pharmacology and toxicology from the University of California, Davis, and has been certified as a Diplomate of the American Board of Toxicology since 1986. He has reviewed more than 140 documents evaluating human epidemiological or animal toxicological evidence for the OEHHA or other agencies, including the U.S. EPA. Dr. Alexeeff has recently served on three National Academy of Sciences committees and is a current member of the U.S. EPA Science Advisory Board's Drinking Water Committee and the U.S. EPA Science Advisory Board’s Hydraulic Fracturing Research Plan Panel. His professional activities include past president of the Northern California Chapter of the Society of Toxicology, past president of the Genetic and Environmental Toxicology Association of Northern California, member of the Society of Toxicology, and charter member of the Society for Risk Analysis.